California passes ambitious climate law. Now what? It’s hard to overstate how ambitious a new California law is in its goals for slashing greenhouse gas emissions. Already a leader in climate change policy, the state must now cut statewide emissions to 40 percent below 1990 levels by 2030. No matter how many more people move into the state. No matter how much the state’s economy grows. “This is big, and I hope it sends a message across the country,” Gov. 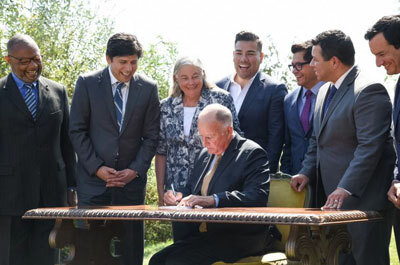 Jerry Brown said when he signed the hard-fought Senate Bill 32 into law at a Los Angeles press conference on September 8. The legislative victory for Brown comes after the bill had stalled in the state legislature last year amid intense lobbying by fossil fuel interests and proponents’ inability to garner enough Democratic votes. Not so this year. The new target for 2030 builds on Assembly Bill 32, California’s landmark 2006 legislation mandating that statewide emissions fall to 1990 levels by 2020. A few numbers for context. In 1990, statewide emissions were 431 million metric tons of carbon dioxide equivalent (MMTCO2e). By 2006, when AB 32 was signed into law, statewide emissions had risen to nearly 476.5 MMTCO2e. Emissions a year later peaked at 484.2, and except for a slight increase in 2012 they have fallen each year. By 2014, the latest year for which data are available, annual emissions in California had fallen to 441.5 MMTCO2e, just 10 million metric tons short of the goal for 2020. At the same time that statewide emissions are falling, California remains America’s largest economy. The state produced $2.44 trillion of economic output in 2015, just above the GDP of France. Meanwhile, California’s population grew from 29.8 million people in 1990 to more than 39 million people in 2015. Meeting the new 2030 target, however, is going to be – as Sweeney said – damn hard. 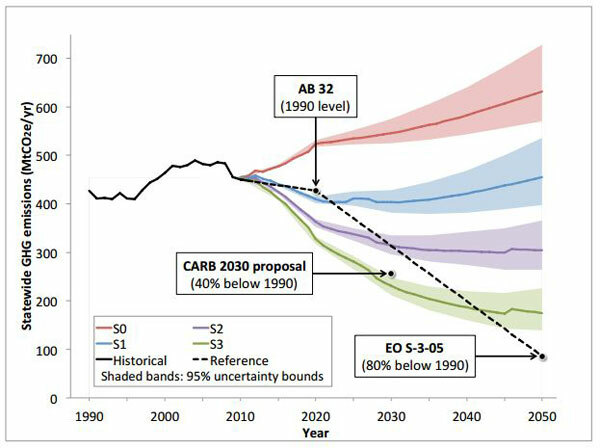 California emissions will have to fall from 441.5 to roughly 260 MMTCO2e to reach 40 percent below 1990 levels. So, how will the state achieve the new target for 2030? Some laws already on the books will help. Governor Brown signed a law last year, as Rogers wrote, that requires California utilities to produce 50 percent of their electricity from renewable sources by 2030. And new federal regulations require automakers to increase gas mileage from about 27 to 54 mpg by 2025. But these laws, and others instituted by the state since 2006, on their own will not get California to 260. Last year, scientists at the Lawrence Berkeley National Laboratory conducted a study that modeled how the state might achieve the 2030 goal. Methane gas is captured from landfills and repurposed for energy use. Relying on nuclear energy in California would be a tricky proposition. San Onofre Nuclear Generating Station, north of San Diego, closed down in 2013 after the failure of replacement steam generators, and it’s now in the early stages of decommissioning. Meanwhile, the utility that runs California’s only other nuclear power plant, Diablo Canyon on the state’s Central Coast, says it wants to close down the aged plant by 2025. Which combination of measures the state will adopt to cut emissions is hard to predict. In the wake of AB 32 in 2006, the state’s Air Resources Board was tasked with formulating regulations to meet the 2020 goals. One of its signature steps, to form a cap-and-trade system that would channel market forces to encourage polluters to reduce emissions, is now in jeopardy. Under a cap-and-trade program, a ceiling is set on greenhouse gas emissions for a specific number of economic sectors, and then the program’s governing body distributes a fixed number of trade-able pollution permits to businesses in those sectors. The total number of permits available on the market declines over time – essentially placing a price on the “right” to emit greenhouse gases. Under the program “companies either need to cut their CO2 emissions or obtain these increasingly scarce permits – whichever is cheaper,” as writer Brad Plumer wrote in a Sept. 9 article at Vox on SB 32 and its policy implications. The state’s cap-and-trade program is in question for a few reasons – among them a lawsuit brought by the California Chamber of Commerce. The Chamber has argued that the program is illegal because it is in conflict with a successful 2010 ballot measure that redefined all levies and charges imposed by the state as taxes – and those, according to another measure passed in the 1980s, require a two-thirds vote of the state legislature. Given the challenges that California’s cap-and-trade program faces in coming months, it remains unclear that it will survive as a tool the state can use to reach its new 2030 target. While the path toward 2030 won’t be without its speed bumps – and success is by no means assured – California’s lofty goal is worth watching in coming years. It could well point the way for the rest of the nation, and the world.